Everyone knows that tanks are awesome, but what makes this one even more so, is that it is yours. Take it to the battlefield in this great shooting game and try to survive for as long as you can. Destroy all the other tanks and also destroy the environment for some hidden bonuses you will find inside crates. 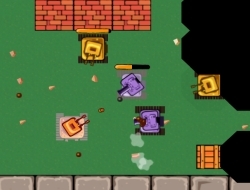 Use the exploding barrels to your advantage and shoot them when other enemy tanks are near them. In between levels make sure you will upgrade your tank with the money you earn and try to make it more durable, but at the same time give it some more firepower. Use WASD or the arrow keys to move and the mouse to aim and shoot. Awesome Tanks 0.00 between 0 and 10 based on 0 votes.